The bombing of San Lorenzo, July 19, 1943. Rome was an outlier in World War II. In the years after 1939, civilians became a military target across Europe as air forces struck the great industrial centers. The blitz on London, the destruction of Coventry, and similar assaults on Hamburg, Berlin, and cities around Italy sought to hurt munitions production as well as popular morale. Yet in the opening stages of the conflict, the Italian capital was spared such attacks. Close to the central Termini station, San Lorenzo was the district hardest hit by US Air Force attacks on nearby rail yards. The 1,674 residents killed on July 19 would become part of its collective memory — victims of Benito Mussolini’s war, yet more directly of the Allies. The knowledge that the Allies had spared ancient monuments, but not people, fed the sense of injustice that an “antifascist community” had paid for Mussolini’s folly. In postwar decades San Lorenzo would, indeed, become renowned as Rome’s “red district.” A center of Communist Party organization, the extra-parliamentary left and (in an area close to Rome’s largest university) the student radicalism of the 1960s and 1970s, it long retained its rebellious identity. Yet as the war generation dies away and the Left fragments, the legends of an “antifascist community” seem ever more distant. The bombing of San Lorenzo did not come from nowhere. If the Fascist regime’s first military setbacks came in lands of colonial conquest, by summer 1943 British and American forces threatened Italy herself. On May 14, the US Air Force’s Flying Fortresses had wreaked havoc on the port of Civitavecchia, around fifty miles from the capital. On July 10 the Allies made their first landings in Sicily, threatening to invade mainland Italy. For 152 minutes the 930 US bombers from bases in North Africa pounded the thoroughfares and rail yards to the east of Rome’s geographical center. The total death toll was around three thousand, and forty thousand Romans were left homeless. 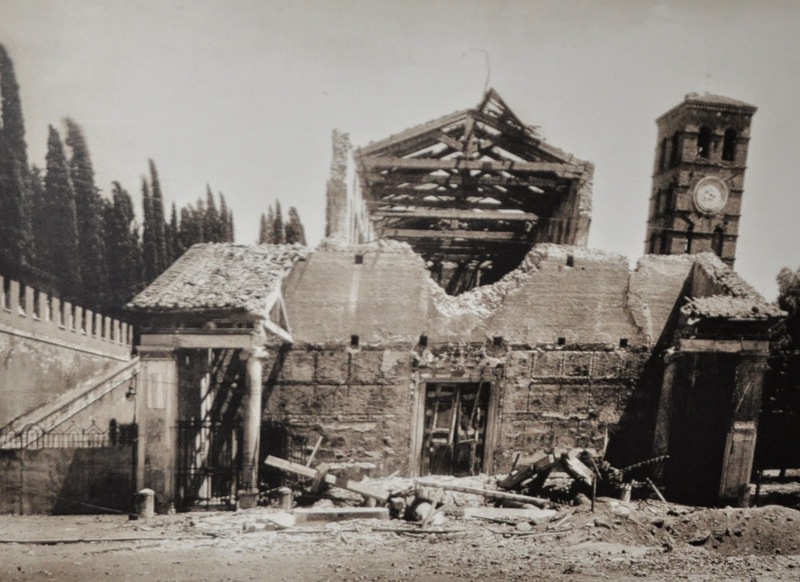 Cities around Italy had been bombed during the war. But the assault on part of a capital previously imagined to be immune from attack had a profound psychological effect on a country on the brink of collapse. A center of authority separate from (if hardly opposed to) the Fascist regime, Pope Pius XII visited the crowds outside San Lorenzo’s Basilica, hit hard by the bombing. A photo of him with both arms extended outward, facing the sky, became an icon of this appearance (though it in fact dated from a later episode). The king thought better of risking the crowds, but Princess Maria José, seen as close to dissident elites, did visit the district. 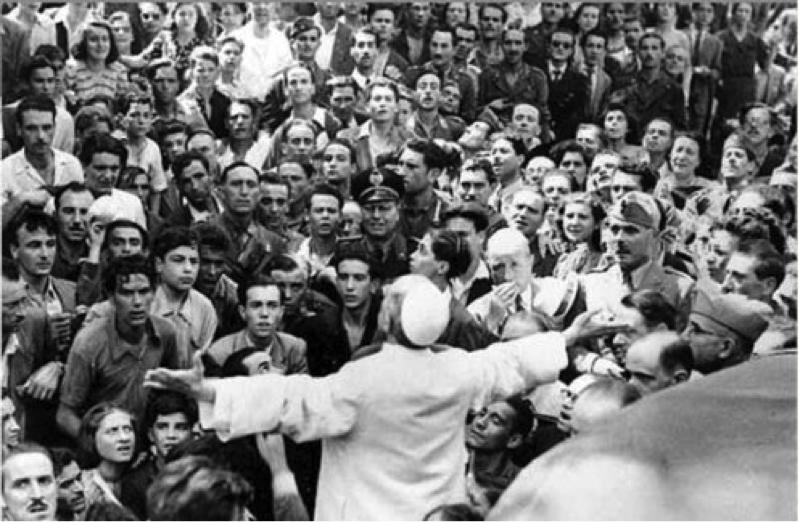 Pope Pius XII and the crowd at San Giovanni after the bombings of August 13, 1943. On July 17 Franklin Roosevelt and Winston Churchill had discussed the prospect of “knocking Italy” out of the war with a spectacular attack on Rome, and the events of July 19 accelerated elite plotting against Mussolini. Just six days later, at a meeting of the Fascist Grand Council, the Duce’s closest allies voted to hand control of the war to the king. The following day Mussolini was arrested and replaced by Marshal Pietro Badoglio. Cruelly for the people of Rome, July 19, 1943 was not the final blow of the war but a first sign of the horrors to come. The elites who had overthrown Mussolini sought to avoid unconditional surrender, and Rome was again bombed by the Allies on August 13. When, three weeks later, an armistice was finally signed, this brought not peace but rapid moves in Berlin to secure the “soft underbelly” of Europe, now vulnerable to the Allies. From September 8 through September 10, the Wehrmacht overwhelmed and disarmed Italy’s Royal Army. As the king and Badoglio fled the capital, its citizens, and its troops, were left to fend for themselves, without any central command. Thus began an underground partisan war fought by disbanded soldiers, draft resisters, and civilians, at the same time as the Allies and the remnants of the Royal Army pushed from the South. In Rome this struggle would continue for nine months. While Allied troops landed at Anzio, just thirty miles from the capital, on January 22, only on June 4 would the Liberators finally enter Rome itself. In this period the citizens were left to fend for themselves, particularly in the peripheral slum districts known as the borgate, but so, too, in less geographically isolated working-class areas like San Lorenzo and Testaccio. For most Romans, the expectation that the war would soon end through Allied victory heightened a focus on self-preservation, not least given the desperate food situation. Rations totaling less than nine hundred calories a day were rarely delivered in full or on time, and they were forced to turn to unofficial channels. By the end of 1943 even a much-depleted police force arrested between four and six hundred Romans per week for black-market activities. After 8 September [the Wehrmacht takeover] local police services disappeared, predictably followed by the looting of schools, German and Italian barracks and private homes, with laws or disciplinary norms openly disavowed. Subversive currents do not refrain from taking on organized form. Only about a month ago did local police reappear . . . Add to this the influx of disbanded soldiers coming to the countryside in this district: youth whose mood and difficult living conditions (mostly Southerners) would alone allow us to consider them easily “won to” subversive currents. There have been thefts of the now-ripe olive-vine harvest; in the fields, thefts of livestock and produce. “Subversive” — in fact, communist — currents enjoyed particular strength in San Lorenzo. Indeed, after July 19 police sources reported rumors that the Allies targeted San Lorenzo precisely because it had a reputation as a “red district.” While there is no evidence that this really shaped Allied commanders’ thinking, this narrative underlined locals’ pride in their radical reputation, imagined a factor in events of far grander geopolitical significance. The myth of the “long resistance” lionized those Italians who had “never given in” to the regime. Researching in Rome in recent years I often heard the boast that fascists “never set foot” in San Lorenzo. Yet only a minority openly defied the regime. Their brave dissent took such forms as removing their children from school, risking unemployment by refusing to sign up to the Fascist Party, or providing aid to the families of political prisoners. If during the dictatorship of 1922 to 1943 “subversive” politics rarely expressed itself publicly, the events of July 19 and then the Resistance helped to cohere a local identity founded on antifascism. The defeated resistance to Mussolini’s initial rise to power, and indeed the “red” traditions of earlier decades, after 1945 came to represent San Lorenzo as a whole, in a mythology of rebellion, tragedy rained from the skies and final redemption. First built in the 1880s, San Lorenzo was never a center of large industry. Its working class notably consisted of building workers (mainly migrants from central-southern Italy) as well as artisans linked to the cemetery, and rail workers. The artisan-led utopian circles and anarchist Sunday schools of the late nineteenth century (San Lorenzo was also home to the first Montessori school) soon gave way to more organized, party politics. The same building on the Via dei Sardi passed from an anarchist circle to the Socialist Party founded in 1892 and then the Communist Party founded in 1921. Yet affiliation to these parties did not mean blind obedience to national leaders. As Fascist Blackshirts began their fight to take over the streets around Italy, and Communist and Socialist leaders preached passivity, San Lorenzo’s Communists were central to antifascist resistance. 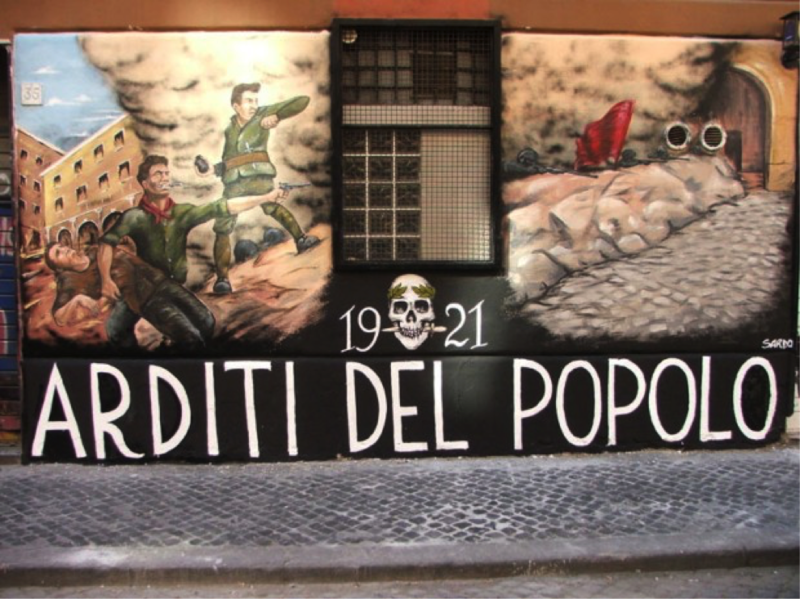 Formed in 1921 after an appeal by a “Proletarian Defense Committee” reacting against Blackshirt violence, the Arditi del Popolo (AdP) mounted the most important resistance. With its “centurions” of disbanded soldiers, led by anarchists, communists, republicans, and freemasons, the AdP reached around twenty thousand members nationally, fighting pitched battles with the rising Fascist forces. Key in this regard was the Battle of San Lorenzo of May 24, 1922, as the increasingly confident Blackshirt movement made its latest attempt to invade the district, carrying the remains of a fallen soldier to the Verano cemetery. Unmoved by the patriotic display, women threw pans of boiling water from the windows at the Fascist marchers. Amid the confusion AdP members opened fire, forcing the Blackshirts into a humiliating retreat. As historian Lidia Piccioni describes, this Battle of San Lorenzo would enter the collective memory as a reaction against Benito Mussolini’s March on Rome, which in fact took place five months later. This assault met with much weaker resistance, after the king had already appointed Mussolini prime minister; it ended with the murder of thirteen sanlorenzini, as a battalion of five hundred fascists led by Italo Balbo wreaked revenge on the district. Working-class resistance in Rome took atypical forms. There were no mass industries to shut down through strikes, so militants made use of the tools they had. Such was the case of AdP veteran Celestino Avico, who used his gravestone workshop near the Verano to make explosives for partisans, or the teenager Dante Pepe, whose job distributing ice to grocers allowed him to cycle around the capital distributing contraband. For priest Libero Raganella, like so many sanlorenzini, the resistance was above all a fight for survival. He was part of a network arranging safe houses for escaped Allied prisoners of war, who would otherwise have been quickly discovered among the Italian-speaking population. Their concern, like for so many Romans, was simply to stay alive until the seemingly inevitable moment of German defeat. The underground was not strong enough to liberate Italy by its own forces. If in the Northern cities the partisans were able to mount insurrections in the days before the Allies arrived, in Rome there was no such uprising. In districts like San Lorenzo a partisan movement dominated by the workers’ parties was able to build popular hegemony, but the capital remained dominated by the Catholic Church and the massed ranks of the middle classes. In postwar decades San Lorenzo cemented its reputation as a “red district,” an outlier despite its proximity to the geographical center of the capital. Bounded by the Verano cemetery, the rail yards, and the ancient Roman walls, it was often termed a “borgo”: a new town outside the city walls. South of the civil servants’ housing at Piazza Bologna and separated from the center by Termini station, it was also an island of Communist Party strength. San Lorenzo has always been a popular neighborhood more like Wedding in Berlin than Athens’ counter-cultural Exarchia. Nonetheless, despite the cultural hegemony of the Communist Party, and the many cooperatives and associations linked to that party, San Lorenzo also became a hub of forces to its left, most notably the Workers’ Autonomy Committees of the 1970s. Via dei Volsci, cutting across the district, was indeed the center of autonomia operaia in the Italian capital. A famous police raid in 1977, late in the social movements of that year, ending in ninety-six arrests, sparked the takeover of a series of buildings on the street, which now belonged to “the movement.” A pirate radio station Radio Onda Rossa was subject to both court attention and, in 1982, a violent attack blamed on far-right Zionists. The 1991 self-dissolution of the Communist Party, long the dominant electoral force in the district, did not mark the end of its “red” reputation. The anti-globalization movements of the subsequent decade, as well as the rise of social centers and other self-managed spaces, marked the district. Take the example of the Cinema Palazzo, occupied since 2011 in opposition to plans to turn it into a casino. 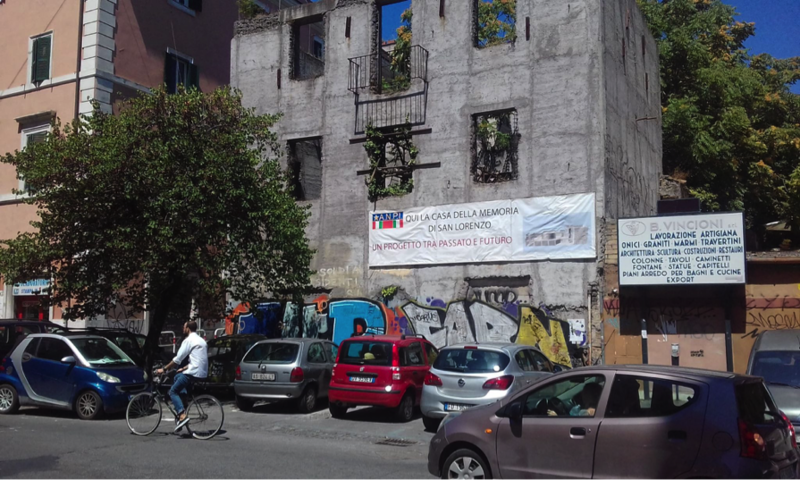 The fight over this historic cinema points to a worrying trend in the urban landscape of Rome. The rise of betting shops in the capital, notably along the Via Tiburtina, points to mounting social breakdown and the irresponsible prioritization of profitability over spaces for community and socialization. As one local newspaper points out, “games of chance” are games played alone, in perma-lit rooms, at great financial cost. The streets of San Lorenzo are today full of home-printed posters and handwritten notices protesting the combined ills of “movida” and “degrado,” the cocktail of night-time street drinking, fighting, and open drug peddling that are ever-visible in the district. Historic movement spaces are now replaced with late-night liquor stores; the district is also increasingly peppered with shops selling drugs paraphernalia. At the same time, rampant AirBnBization threatens the social fabric of a once-popular neighborhood. Rents are already too high for young Italians struck by 35 percent youth unemployment and jobs with no minimum wages; property developers now turn districts into transient stop-bys for tourists. Between 2006 and 2014 its residential population fell by 13.5 percent as renters were pushed out. A site of the planned “House of Memory,” standing abandoned. The response was swift, and the text was repainted. It, like the murals of the Arditi del Popolo and Irish freedom fighter Bobby Sands, and the continuing energetic activity of social centers and movement spaces, stands as a reminder of the area’s traditions. Yet city hall’s threats to occupied spaces, the shutting down of leftist bookshops, and the rise of bland tourist trap bars increasingly threaten its specific identity. In 2010 plans were announced for a new “House of Memory” in San Lorenzo, to be run by the ANPI veterans’ association. Even in 2018 the three-story building is just a skeleton, roofless and without windows. Its banner promises “a project between the past and the future.” Part destroyed, it instead stands as a monument to the weakening of this memory — the hollowing out of the neighborhood that once was.